Many people have been smitten by the amusingly brash manner by Marion, four, as she entered the room and marched up to her father’s desk. SEOUL: The professor who became an incidental internet sensation when his family crashed a live television interview says his wife "deserves a medal" for looking after him and his now-famous children. Video of the interview with Robert Kelly, an expert on East Asian affairs, went viral and sparked a debate about racism after many commentators originally assumed his Asian wife was a hired helper. As Kelly, a professor at South Korea's Pusan National University, shared his insights from his home office last Friday, his daughter Marion waltzed into the room, followed by his toddler son James, who wheeled in on his baby walker. Kelly's wife Kim Jung-A, who was watching the interview on television from their living room, flew in seconds later, flinging her arms in a desperate attempt to retrieve the young intruders, before returning on all fours to reach out and close the door. The interview -- described as a "perfect piece of physical comedy" by the BBC -- spread like wildfire, watched more than 160 million times on the broadcaster's Youtube page as of Wednesday. But it also triggered accusations of discrimination in South Korea after some online posters overseas immediately assumed that Kelly's wife was a nanny. "The babysitter is currently searching for new employment as of now," said a user on Twitter. Another tweeted: "Nanny got fired after this." Major South Korean media outlets said such comments were the result of prejudice about Asian women with white males, with South Korean broadcaster SBS referring to "Caucasian-centred racism". South Korea's biggest-circulation newspaper, Chosun Ilbo, wrote: "Assuming that she was a nanny because she's Asian must have been a subconscious thought." 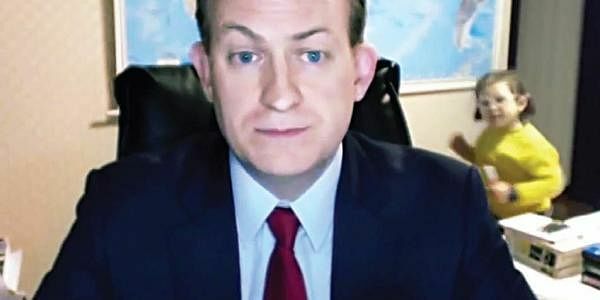 Appearing next to Kelly in a fresh BBC interview on Tuesday, Kim shrugged off the discriminatory comments, urging viewers to take the video more light-heartedly. "I hope people just enjoy it, not argue over this thing because I'm not nanny and that's the truth," Kim said -- as she tried to keep her distracted toddler calm in her arms. Addressing a BBC viewer's comment that Kim deserved a full-on spa day for everything she did in Friday's chaotic interview, Kelly said: "My wife deserves a medal for taking care of us."